I’ve been fascinated by the story of Felicia Browne the English woman killed fighting on the front line in a workers militia in Spain in August 1936 and a woman who seems lost to history. So much that there’s no photo of her to be seen anywhere on the net or elsewhere. So I’m well pleased to have found this photo of her taken from her passport application in 1931 and obtained from her Special Branch files. 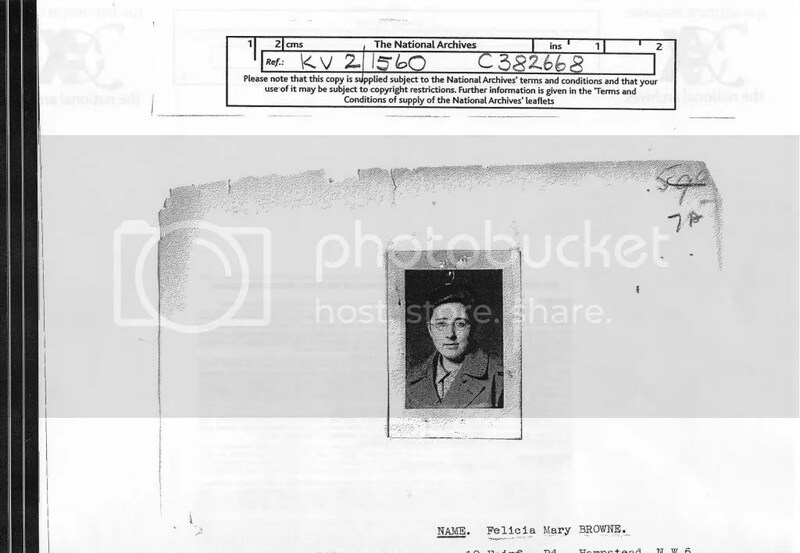 I now have the whole of her MI5 files so if anyone else is entused by her story like me and wants to research more I’m happy to pass them on.The files reveal that Browne first came to Special Branch attention when she was a patient in Guys Hospital and tried to convert the nurses to communism – special branch were well quick off the mark! hi, I am a dutch researcher investigating the life of fanny schoonheyt (1912-1961), a dutch woman who fought in the same militia in the battle of tardienta as felicia browne did ( the colonna of del barrio). I wonder if in the MI5 files in your possession there is any reference to this battle. In case I would be very interested to get a copy. Hi, I’m interested in researching Felicia Browne as I believe she is related to me. I would be grateful if you could send any information you may have to me. Hi, I am interested in Felicia as she is a distant relation. Any information would be happily received. I think my brother has lots of information about her too…in particular a sketch of Felicia. Excellent research, well done. Will you please get in touch with me because I would like to discuss the photograph of Felicia. I’d love a copy of the files if that’s possible. I’m a writer in need of a new topic. Thanks ever so much. Hi Ian, I am another relative who would love a copy of the files if possible. Re the post by Jesus Ornia (above), the alleged picture of Felicia on http://www.sbhac.net/Republica/Imagenes/Armas/Infanteria/Armas01.htm is I believe actually of her mother Edith (see http://math.boisestate.edu/GaS/whowaswho/I-J/JohnstonEdith.htm). A couple of years ago I met Felicia’s nephew John Alcock who mentioned that he saw a doco which showed a picture of Felicia cradling a baby which he realised was him! Anyway, I don’t consider she has been lost to history. Contrast this to her brother, William (“Billie”) who died in Spain 12 March 1938 but (at according to my father) on the Franco fascist side; I thought John Alcock would be able to tell me about him, but neither he nor anyone else seems to know much. I’d be interested to hear from Jonathan and Emma (above) or other rels. I replied to Ian’s post earlier (see above). Unfortunately the terms under which the files are released state that they may not be reproduced. I now have a copy of the files myself and as Ian states, they are fascinating reading. I am a writer who specialises in the British volunteers during the Spanish Civil War. My latest book can be seen on http://www.open-eyes-press.com/#! I am presently conducting research into the feasibility of writing Felicia’s story. I am excited by your statement regarding Felicia’s brother William. I would love to know of any more details if you would care to share. I would also love to get in touch with John Alcock or any other relatives who may know further details of their stories. You can contact me via http://www.open-eyes-press.com/contact if you are able. Sorry to highjack your thread Ian, hope you don’t mind. Thank you and all the best. Hi John, I’d be happy to share details but I have almost none. I’m trying to contact Felicia’s nephew Peter Marshall whose family was good on genealogy. I’m a more distant relative. I’ve had some software difficulties getting to your website but will try again. My email is trumps at (the symbol, but I don’t want spammers’ spiders to pick up on it) trumps.net.au so we don’t need to hijack Ian’s thread! Was interested to read all the letters, Felicia was my aunt, I am named Felicia after her. The photo you have shown is definately Felicia, I have a copy of the photo holding the baby, it is my brother who sadly passed away earlier this year, I have some of her original drawings and a large collection of photographs of her from early childhood up, I’m afraid I am not very good at keeping up with email’s etc but have passed information to Derrick Browne , but was sidetracked in my intention to send him photos of the drawings etc. Sorry about that. These are all extremely interesting posts. I am keen to know more about Felicia, who was a close friend of my father’s in the 1920, when she was a student at the Slade School of Fine Art. It was she who encouraged my father, William Coldstream, to apply to study painting at the Slade. I am currently writing about this period in my father’s life and would welcome any more information about Felicia or about her brother William. Were there any other brothers? There is some mention of Felicia Browne in Bruce Laughton’s biography of my father: William Coldstream (Yale, 2004), page 6-7. I would love to hear from any other contributors to this thread! Hi CMC, see my earlier post for my email address (if you can work out the code) and also re the pic which we believe was of Felicia’s mother, playing Maraquita in The Chieftain. Felicia had no kids and Billie’s daugther died youngish, so there are no direct descendents. Felicia’s two female siblings had offspring so they are the closest rels (e.g. Felicia’s niece Felicia Reeves nee Alcock). Those of us with surname Browne are most distant rels, e.g. my grandfather was a cousin of their father. So I’m no authority but I have a little stuff including info from John Wainwright (who posted above) and Felicia R. Unless they advise me not to pass it on (and I don’t think they had any such stipulations), I’m happy to forward to you if I have anything fo interest, maybe email me direct.